J&M Z-Series Lower-Section 8-pin Lower Cord HC-ZJM. J&ampM headset lower cord HC-ZJM heavy-duty Z-Series 8-pin lower-section hook-up cord is to be used with all J&ampM Elite Series headset: HS-ECD 629, HS-ICD 629, HS-ECD 584, HS-ICD 584, HS-ECD 477, HS-ICD 477, HS-ECD 374, HS-ECD 271 &amp HS-ECD 269 headsets for connection to 1998-2013 BMW &amp J&ampM 6-pin audio systems. HC-ZB to be used with: 1980-2013 Honda &amp J&ampM 5-pin audio systems. HC-ZHD to be used with: 1998-2013 Harley 7-pin audio systems. 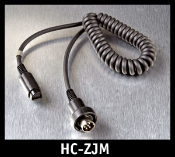 HC-ZJM to be used with: 1999-2013 J&ampM Corp &amp BMW 6-pin audio systems. HC-ZVT to be used with: 2008-2013 Kawasaki, Can-Am Spyder &amp Victory Vision 7-pin audio systems. HC-ZC to be used with: 1983-2013 Yamaha 5-pin audio systems, 1989-1997 Harley, Kawasaki Suzuki 5-pin audio systems and 1988-2000 Honda GL-1500 with J&ampM passenger controller.